Can Your Optometrist Detect Diabetes? Diabetes is a serious medical condition that occurs when a person’s body produces too much insulin. However, one of the biggest dangers with diabetes is that there may be no symptoms until the disease reaches a later stage. But your eye doctor may be able to detect very early and before you even experience symptoms. Why Is It So Important To Detect Diabetes Early? Diabetes should be treated as soon as it is detected. If left untreated, diabetes can result in total permanent blindness. 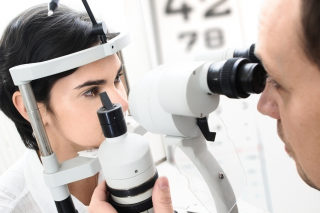 According to the researchers, when diabetes is detected early, with a timely treatment and proper follow-up, the risk of vision loss from the retinopathy is reduced by 95%. How Does The Doctor Examine My Eyes? There are several parts to a general eye exam. The first part is a simple conversation between the patient and a doctor. The doctor asks the patient about known illnesses she or he may have or be at risk for. The eye doctor also asks if there are any signs of complications or problems. The second part is a general visual activity test, which involves reading letters and numbers of different sizes off a chart. The patient stands 20 feet away from the test chart, and the doctor asks the person to read what she or he can see. The numbers get smaller with every new line, and the patient should cover one eye while reading the lines. This test tells the doctor the prescription strength, if necessary, that the patient will need for corrected vision. The last part of the exam is the eye pressure test. The doctor puts dye in the eye that enlarges the pupils. Then doctor examines different parts of the eye and ensures that everything is functioning properly. There are also other tests that may be necessary during the exam. Color acuity test, glaucoma screenings, and retinal examinations are the most common ones. Then the doctor will be able to give a proper diagnosis. Diabetes is one of the conditions that an eye doctor may find if he notices some common symptoms during the tests. A general eye exam can show the main symptoms of diabetes. [A general eye exam can reveal conditions occurring in the eyes that may be early warning signs of diabetes. ]For example, the doctor may find some strange fluids and blood drops. These fluids may come from the tiny vessels in the retina, and if the doctor sees blood drops or yellow fluid, this can be a reason for more serious tests. These symptoms would make the doctor ask more questions and send the patient to complete diabetes tests. A firm diabetes diagnosis can be found after the urinalysis, glucose test and some other tests.